When replacing the forward recognition camera, replace it with a new one. Do not touch the camera lens. If the camera lens has been touched, do not use the forward recognition camera. If the forward recognition camera has been struck or dropped, replace it with a new one. If the forward recognition camera is not properly installed, forward recognition camera optical axis learning cannot be performed properly. Make sure the forward recognition camera is installed securely. Replace the forward recognition camera if there is any foreign matter on the camera lens. When replacing the windshield glass of a vehicle equipped with a forward recognition camera, make sure to use a Toyota genuine part. If a non-Toyota genuine part is used, the forward recognition camera may not be able to be installed due to a missing bracket. Also, the dynamic radar cruise control system, forward recognition camera system, lane departure alert system, pre-collision system may not operate properly due to a difference in the transmissivity or black ceramic border. If the forward recognition camera bracket is deformed or damaged, replace it together with the windshield glass. If there is any foreign matter on the area of the windshield glass in front of the forward recognition camera, clean the windshield glass before installing the forward recognition camera. Do not touch the camera lens after removing the protective cap. 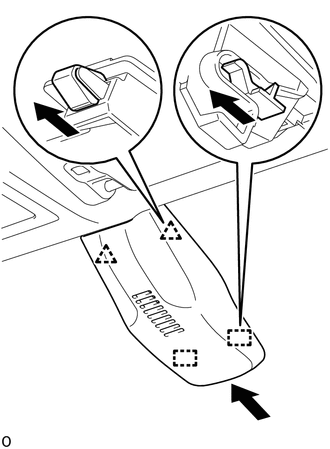 (b) Engage the 4 guides to install the forward recognition camera as shown in the illustration. 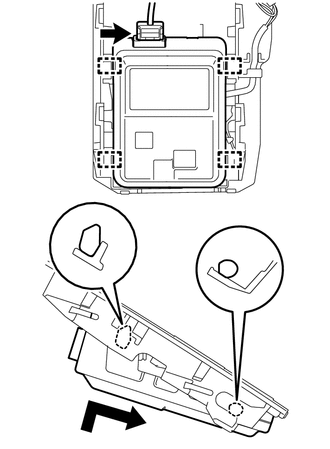 Before installing the forward recognition latch, be sure to check that the forward recognition camera is securely installed. 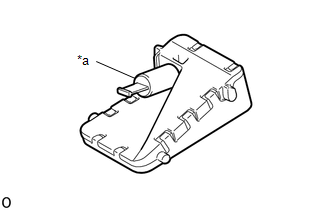 (a) Engage the 4 guides and 2 claws to install the forward recognition latch as shown in the illustration. Check that the forward recognition latch is securely installed. 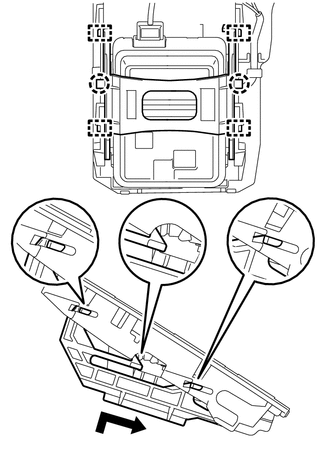 (a) Engage the 2 guides and 2 clips as shown in the illustration to install the No. 1 forward recognition cover. When installing, press the cover parallel to the windshield glass surface and install. (a) If the forward recognition camera has been replaced or the windshield glass has been removed and installed, it is necessary to perform Forward Recognition Camera Learning.